Linda will be presenting a workshop at our next conference. 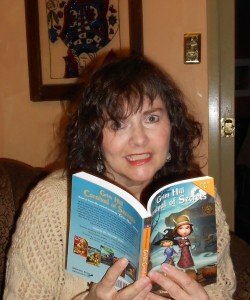 I don’t usually get to chat with successful authors, so when I was given the chance to interview Linda DeMeulmeester, author of the award-winning Grimm Hill series and a presenter for the 2014 Richmond Junior Authors Writers Conference, I jumped at the chance. From the usual (why did you start writing?) to the quirky (what’s your favorite midnight snack?) to the question everyone’s been wondering about (what can participants expect from your workshop at the conference? ), Linda answers it all below. Why did you decide to pursue writing as a career? When I was six my mother said I wrote a good story. Then in grade five I won the school’s writing contest. Well, not really although those things happened. I decided to pursue writing for one reason only, and that is because I fell in love with writing! I started writing a short story and couldn’t believe how much fun it was, and how happy it made me. Then I found out I actually could write a story and a publisher would publish it. That made me very focused on improving my craft, and gaining knowledge about the writing business. What advice would you give yourself if you could travel five years into the past? The advice I would give myself is to always live in the moment with my career, friends and family life. It’s important not to get too caught up in my career, so I’d also tell myself never take everything too seriously, and always build in the fun things that go along with writing such as attending exciting workshops or conventions with friends. Currently, I’m working on a brand new middle-grade manuscript that has mystery and adventure––kind of my favourite story to write. 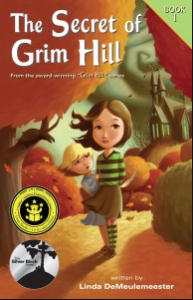 How did you come up with the idea for Grim Hill? I was watching a soccer game on top of a hill just before Halloween, and one of the teams’ uniforms was orange and black. I thought what if there was a lot more at stake than winning a soccer match––what if in winning or losing something diabolical would happen? Which author or authors influenced your writing style the most? Hm, I think, ultimately, writers find their very own voices. That said, Ray Bradbury is probably an influence and perhaps Madeleine L’Engle. I admire how they’d bring a sense of suspense and wonder into their stories. What is your favourite midnight snack when you‘re up late writing? This question is easy because I’ve been there and done that: M & Ms.
What can participants expect from your workshop at the Junior Authors Writer Conference in October? People can expect an interactive workshop as I take them through the writing process and how I work out what makes a good scene and a good story.